look who is on the evening news!!! yes that is mr. goodwill hunting's alter ego...rashon carraway. lol. 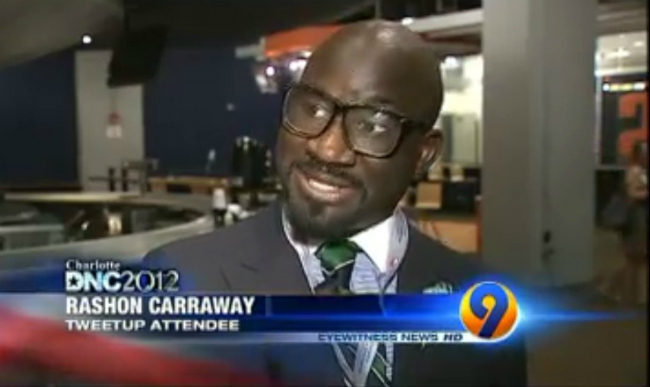 today i was selected to be part of a story about the dnc behind the scenes tweet-up that took place at time warner cable arena, in charlotte, nc (the site for the 2012 democratic national convention in september). the tweet-up is BIG history for charlotte, nc as we have not hosted a large political gathering since the 1800s. this is also big for the dnc, because it is the first behind the scenes tour via social media. what many of you may not know is that i have a degree in political science and a double minor in mass communication and sociology. i love politics. click on the image above to see what i had to say about social media and its influence.